Animis Foundation caring for an eagle that was found two years ago. This eagle tested positive for phenobarbital. Photo provided by the Animis Foundation. Correction: A previous version of this article stated “the animal shelter euthanizes anything under three pounds,” when it is actually two pounds. Also, the word “allegedly” was added before the word “poisoned.” Statements from Marion County Public Information Manager, Barbra Hernández, APR have also been included. Ocala, Florida — It has been 14 days since two eagles were allegedly poisoned at the Marion County Baseline Landfill, leaving one dead. After being rehabilitated, the surviving eagle was released back into the wild. 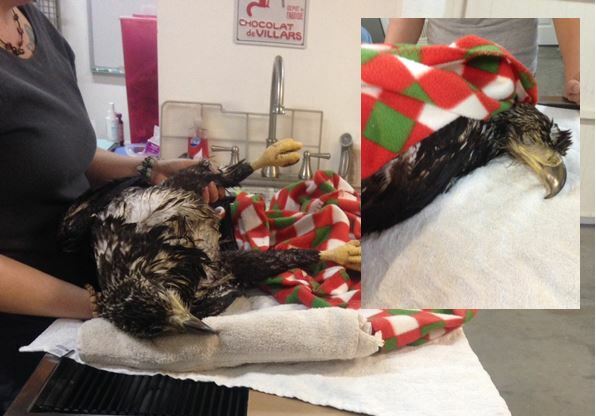 The inspection was performed eight days after the two eagles were found at the landfill. The statement suggests the procedure was merely described by employees, but not actually witnessed by inspectors. Ocala Post reached out to the DEP for clarification. DEP Public Information Officer Mara Burger confirmed that the procedure by which the facility disposes of animal waste was a review, but the actual act of disposal was not witnessed in person. Simply put, the inspectors relied on the word of landfill employees. The inspection also did not include water tests. The fact remains that — for the second time — two more eagles were allegedly poisoned by ingesting phenobarbital from an animal that had been discarded, by the Marion County Animal Shelter, at the landfill. Pentobarbital is a barbiturate, which slows the activity of the brain and nervous system and is commonly used to euthanize animals. While the county admits they dump euthanized animals at the landfill, county officials say it is within state guidelines. Ashley Smith, who shadowed at the Marion County Animal Shelter, said what she saw at the animal shelter was heart-wrenching. She said the shelter needlessly euthanizes animals. “Many animals do not go as quickly as one would prefer, and their final moments are definitely not quick nor painless,” Smith said. Multiple individuals claiming to be former employees of the Marion County Animal Shelter have described similar circumstances to Ocala Post in various e-mails. “In fiscal year 2013-14, Marion County Animal Services represented only about 27% of the total deceased animals delivered to the landfill. Marion County Solid Waste accepts deceased animals at the landfill from any individual or animal-related agency, regardless of the type of animal or cause of death (whether natural or by euthanasia). Due to special disposal requirements, Solid Waste requires residents and agencies to notify if the waste they are disposing includes deceased animals, hazardous materials, chemicals, sludge or other, in accordance with the rules or statutory requirements or permit conditions. Deceased animals brought to the landfill must be reported to staff for proper burial. However, staff has no way of telling if someone or a business deposited deceased animals at the landfill without properly reporting it. For all reported and spotted deceased animals, staff follows the strict regulations in place,” Hernández wrote. The foundation said as long as poisoned animals are being dumped like trash, local wildlife will continue to die. They said the standards set by the state are clearly not working. The U.S. Fish and Wildlife Service (FWS) is still investigating. The contents of the eagles’s stomach is also being tested.